For a long time my favorite “mech” has been Battletech’s Marauder. Granted, the Marauder design is a relicensing of the Glaug battle pod from Macross, but I first encountered in the novel Decision at Thunder Rift and it’s stuck as my favorite “mech” design since. 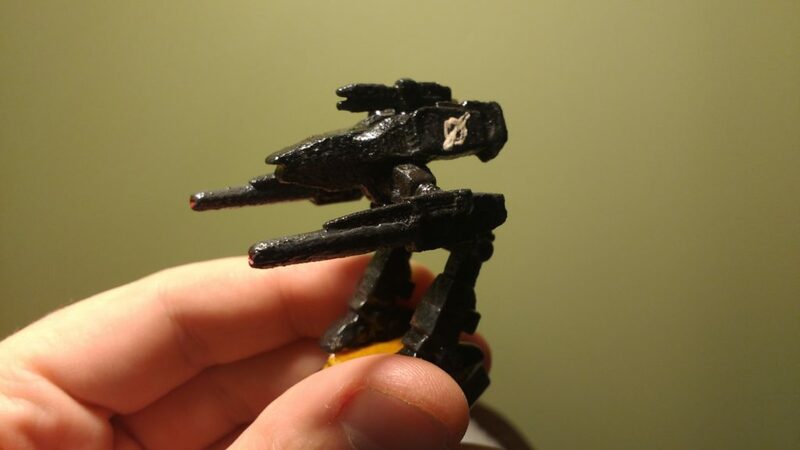 So when one of my friends decided to start up a tabletop mech game I decided that would have to get a proper miniature. The problem was then that it was difficult to find a proper Marauder due to the legal issues that sometimes come with copyright infringement. There are models out there but they were either more expensive than I was willing to spend or made out of metal which really intimidated me at the time. So I did some looking around and picked up the Nightshade from CAV: Strike Operations. It’s basically a Marauder clone. This is the finished product. My character in the game is a hacker using the call sign Null, hence the symbol on the side of the walker. I was very pleased with the sculpt and quality of the miniature. However, while I was pleased with it as my first attempt at painting, there were some major mistakes with the paint job and I think that I’ll eventually “upgrade” to another model that’s a bit closer to Marauder. My first mistake was priming the miniature. It’s necessary to prime metal miniatures but this miniature was made from “Bones” plastic which can be painted on directly. I’ve painted several miniatures made from Bones since this one. Something else that may have been a mistake was using Krylon’s CoverMax as a spray-on primer. It came on clumpy and obscured many of the fine details of the sculpt. It did leave the model with a cool sort of cast iron roughness that I appreciate. I’m not sure what exactly went wrong with the priming (but something clearly went wrong). I’ve seen a lot of painters recommend CoverMax as an alternative to more expensive brands of spray on primers but it could be that I just went too cheap. It could also be that the humidity was off, something that commonly screws up spray on primers. It being my first attempt my technique was also bad. To be honest, the whole experience put me off spray on primers and I’ve had a lot more success with easier to control paint on primer. For my final step I lathered the painted miniature in Minwax Polyshades Antique Walnut Satin. This was a take on DIP method of varnishing miniatures – the miniature was too large to actually dip. I decided to take this route because this method is relatively cheap and results in very durable miniatures. I tend to be rough on my miniatures in tabletop and want them to be able to hold up. This did leave the Nightshade miniature tacky to the touch for about a week before it fully dried. I’ll talk more about this pros and cons of this method later – but I’m a big fan so far primarily because I’m out for rough and tumble miniatures. Also, I’m developing a dislike for spray on anything because I’ve had bad luck. Thanks for the advice! I still have that can of primer so I’ll give it a try once it warms up. Until then, I’ve been having good luck with gesso now that I’ve thinned it…but it takes a long time to dry and I’m often impatient since my painting time is limited. I’d say definitely try it again under optimal conditions. And one thing I did forget to mention in my previous comment was that it is vital to wash miniatures before priming / painting. It took me MONTHS to figure out why the first coat of paint/primer wasn’t sticking to the plastic/metal, especially the Bones miniatures. It was only after I started washing my miniatures with warm water, liquid or dishwashing soap and a toothbrush (then letting them dry thoroughly) that I realised how easy it is to prime and apply the first coats of paint. I have started washing them recently…but I honestly can’t remember if I washed that first one. Probably not considering all the problems I’ve had with it! Thanks for tip.